It’s rare that I come across soap in a solid block now. Everything seems to be some sort of liquid or gel or foam. I’m guessing the soap companies like it because we probably use the liquid forms a lot faster. Hopefully solid soap will be around enough that people will still get this comic in the future. I still use a bar of Irish Spring everyday. I still prefer solid soaps and I think I’m the only one in my surroundings who does. There’s something…..solid? and good on the soap bars. Bars were meant for bathing, and foams are the ultimate for hand washing in my opinion. Loved this one…but, it erks me to see Kraken spelled Cracken, despite both spellings possessing equal legitimacy. Perhaps a lot of people switched to liquid soap after watching The Darwin Awards. The Kraken can reach anywhere! Anywhere! I have a small shower stall, and soap bars really aren’t ideal for it. I use a glycerin bar for my face, but the rest is body wash.
With his knowledge of sea/tub monsters, Biff should have secured himself a role in “Pirates of the Carribean”. …But on the other hand, seeing both Johnny Depp and Biff on screen would make the universe implode from sheer surrealism. Bars of soap have to stay around, otherwise what will small children get from their old relatives instaed of the toy they really wanted? That’s an interesting place to put the soap when trying to reach the Kraken. Wait, just looked it up, never mind. 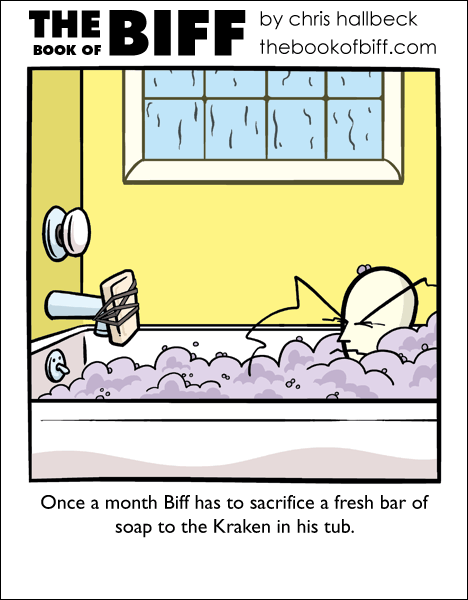 Biff has a Kraken in his tub? Methinks he needs to clean his bathroom more often. What flavor it the soap Biff? ARGH I completely HATE liquid soaps, I don’t understand why they’re so popular! However hard I scrub I cannot get the liquid soap to stop making my hands feel slimy and disgusting. How can people use those things? Lever 2000 Bar all the way. Liquids are fine for laundry, dishes, cars, hands, and other surfaces. I need a bar. Liquid just washes off before my hands can put it anywhere. Saiph: That is what body poufs are for. Lever 2000 and most other bar soaps cause nasty allergic reactions in me. Certain liquid soaps don’t. He should just sacrifice Jack Sparrow! @Matt Lee: Jack Sparrow already sacrificed himself, for the good of the others on the ship, remember? Okay, I have to be a huuuuge nerd and point out that there is a big group of environmentally-minded people who hate liquid soaps because of all the plastic packaging and extra shipping weight they involve. If companies like ‘Lush’ survive, solid soap will never die. Dial gold bar. I was raised on that soap. Someday when I go bald and shampoo is no longer required, it’ll be the only thing in my shower. I mean, a bar you can just rub yourself with, which is inherently manly because it’s like rubbing yourself with a rock or a piece of lumber. Why buy something in extra packaging, that’s mostly water, so you can get it wet, and must be used with a specially-bought fluffly apparatus that will require additional cleaning or replacement? It’s just inefficient. @Marr965 Yes I know that! It was a joke! Jokes like mine can exceed the laws of time and space! The sooner you get used to that the better! Liquid soaps are popular because they don’t have added wax to make them into a solid bar, therefore don’t leave nearly as much soap scum on skin and fixtures. Liquid soap is popular because manufacturers can make it for cheaper and sell it for more. Its not any better than bar soap, really, and the additives contribute to overreaction from the immune system, vis a vis allergic reactions. Greetings from the future! I still understand this joke!